PTS will be hosting this event for CoreNet Global. Attendees will receive a high-level overview of the NY/NJ data center market, and dive into the type of clients who are driving demand and the services they value. 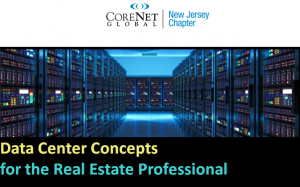 The second part of the session will focus on helping real estate professionals understand key data center concepts like colocation, cloud and connectivity. Lastly, the speakers will focus on site selection considerations, and lease/licensing agreement structures. LAS VEGAS, NV–(Marketwired – July 11, 2016) – Today at Cisco Live, Cisco’s annual IT and communications conference, Bayshore Networks, Inc., a provider of technology that safely and securely enables the Industrial Internet, announced a strategic alliance with PTS Data Center Solutions, an Oakland, New Jersey-based provider a data center availability solutions and services.